EDITOR’S NOTE: President Abraham Lincoln said, “Don’t worry when you are not recognized, but strive to be worthy of recognition.” That certainly describes so many of the people at The University of Texas Rio Grande Valley. They work each day behind the scenes, away from spotlights and accolades, but still knowing they have a job to do that supports the university community. For an institution as large as UTRGV to work efficiently, many people must contribute – but some of them go unnoticed. Our Unsung Heroes series highlights just a few of the people who often go overlooked, despite their importance and contributions. Esperanza Rocha gazes occasionally out her office window to enjoy a view of UTRGV’s beautiful front lawn. Her job is to answer questions from university faculty and staff about employment education, and she works hard to help make the process go as smoothly as possible. She jokingly refers to herself as a traffic director, because her office – where photographs of her seven grandchildren peer down at her from a shelf above her computer – is right across the hall from the elevator. 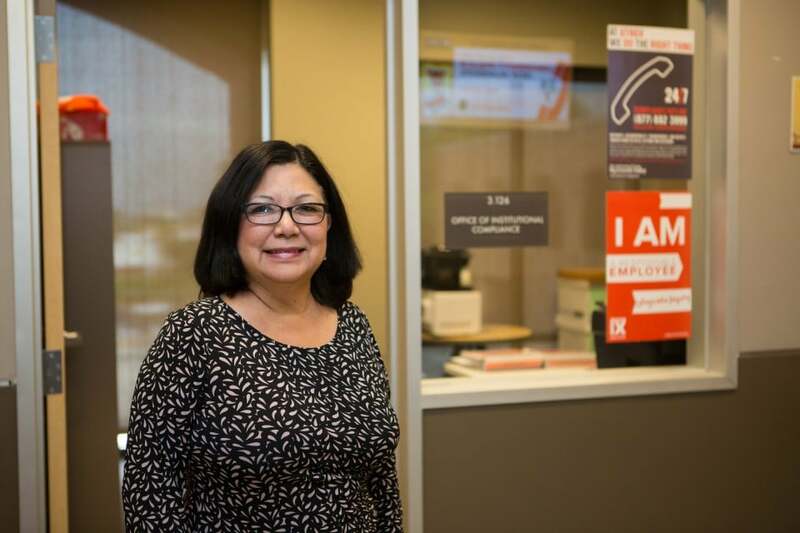 She has a lot of interaction with the university community that way, and one of the things that impresses her the most about the students at UTRGV is how polite they are. WHAT IS YOUR ROLE AT UTRGV? Compliance Specialist – I assist with the communication, oversight and monitoring of compliance programs within the university. I started my employment with the Occupational Therapy Department in 2006 and then moved on to work for the Office of International Programs before coming on board with Institutional Compliance. My average day consists of answering questions and providing navigational guidance, so employees can complete the required training assignments on Blackboard and/or reporting to the employee online portal, generating reports, data entering, and monitoring and tracking compliance issues. My favorite part of my job is providing great customer service - whether it be in person, via Skype, over the phone or in writing, to those individuals who contact our office. I have a granddaughter who started her first semester at UTRGV in the fall semester. I am wholeheartedly excited for them and I feel confident that UTRGV will provide a great academic experience for them. DO YOU HAVE A FAVORITE MEMORY OR STORY FROM YOUR TIME HERE? My favorite memory is of then-presidential candidate Barack Obama’s visit to the campus. I remember that even though it was a hot day in February, that didn’t stop the crowd from showing up. It was great to see the enthusiasm and involvement of so many students. DO YOU FEEL A SPECIAL BOND WITH THE UTRGV COMMUNITY? I have met so many wonderful individuals and made many lasting friendships. So, yes, I do feel a special bond with the UTRGV community. I’m especially thankful to the staff and faculty for their support and encouragement in achieving my lifetime dream of attaining my bachelor’s and master’s degrees.